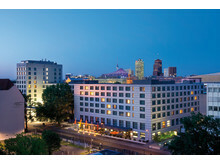 The Maritim Hotel Stuttgart has renewed splendour. 25 years after the largest Maritim Hotel opened and following several partial renovations, all 555 rooms and suites, including the bathrooms, events rooms, public areas and the underground car park have now been fully modernised. After 22 successful years and several partial renovations, it was time for the Maritim Hotel Stuttgart to undergo a thorough makeover: all 555 rooms, the bathrooms, the kitchens and the conference rooms are being renovated.